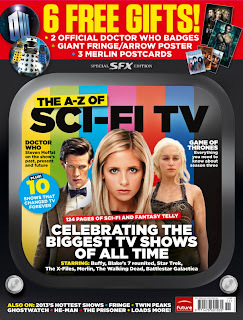 A full 124 pages of the best TV from past, present and future can be yours for only £7.99 in print form - with digital versions available too. 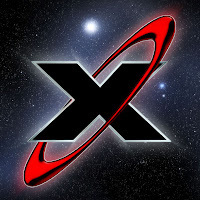 For more info, click here to visit sfx.co.uk! So... last night went alright. Since yesterday, I must've said 'Thank-You', 'Cheers' or 'Ta' several dozen times (at least!) 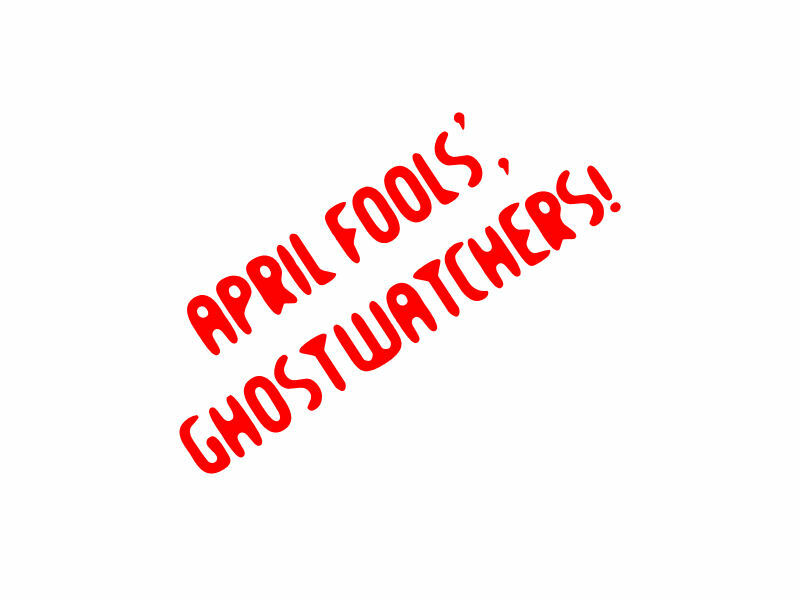 to everyone who joined in last night's festivities, so I promise, this is absolutely the very last time I'll say it again... THANK YOU! And not only that, but at one point, we were trending on the nationwide UK Twitter list - at least, sixth from the top with several hundred messages all coming through at once (though BtC supporter Daniel Ford has reported at one point, we reached as high as fourth place!). For the first time, we also had a plethora of fan photos come through to mark the event. A selection of which, you can check out below. ABSOLUTELY LOVE THESE. WOW. It's pointless me trying to explain how the evening went. You simply had to be there. Last night was my Woodstock, man. So, I'll leave you by simply saying - same time next year? And thanks, everyone! ...Damn, I said it again. 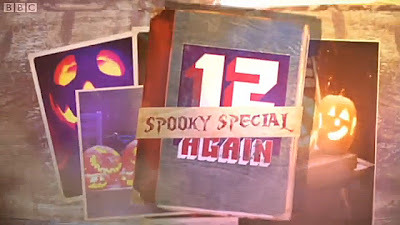 During today's Hallowe'en edition of popular, kids' TV, nostalgia fest, 12 Again, a few of the interviewees discussed their experiences with spooky TV - ranging from The X Files to Most Haunted, 999 to Worzel Gummidge, and even Ghostwatch. It's truly remarkable how clips from one of the most infamous British Horrors can wind up being broadcast during the CBBC time-slot (how times have changed..!). Least of all when you consider the twenty year long (to date) gap between initial broadcast and now (which has yet to see a single repeat in full). 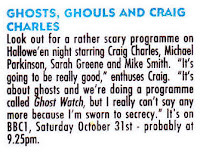 Still, nice to see the show getting a mention in time for Hallowe'en. 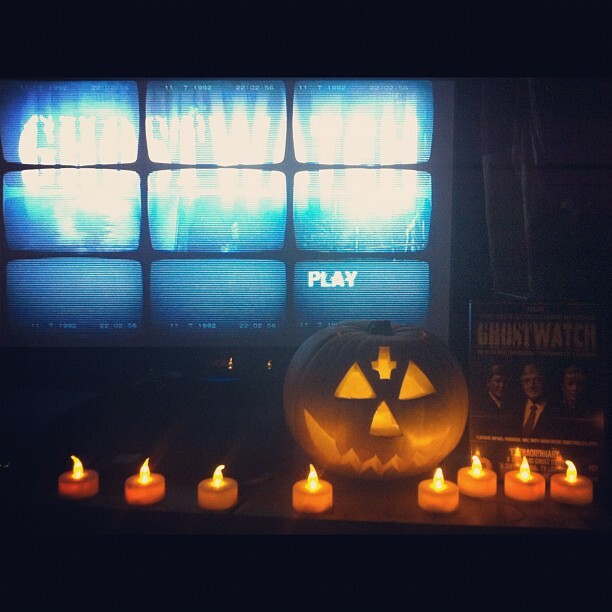 To check out the Spooky Special for yourself, click the image below and head to the 22:10 mark. 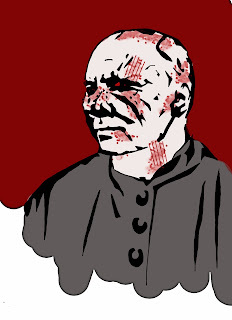 Just be sure to shake your head incredulously when the "zombie" line comes up. Be sure to head on over to SFX.co.uk if you want to catch the exclusive premiere of the trailer for Ghostwatch: Behind the Curtains - the upcoming retrospective documentary that's been five... actually, make that, twenty years in the making..! 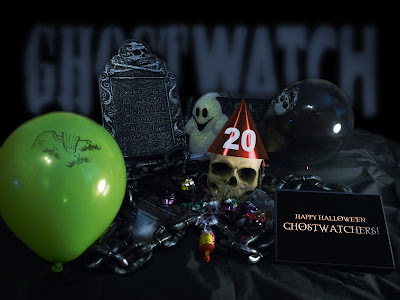 Release date is currently 2012 (in time for the show's 20th Anniversary) with more news on that front hopefully coming very soon indeed. Yes. If you can believe it, the finish line is finally in sight. Thank you so much for your support. Lesley Manning and I can't wait to show you what we've made together. 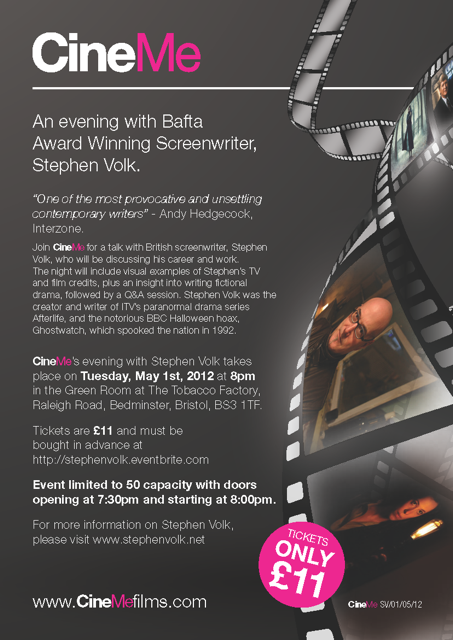 Special thanks goes to Arfon Jones who created the wonderful original artwork for our announcement poster! 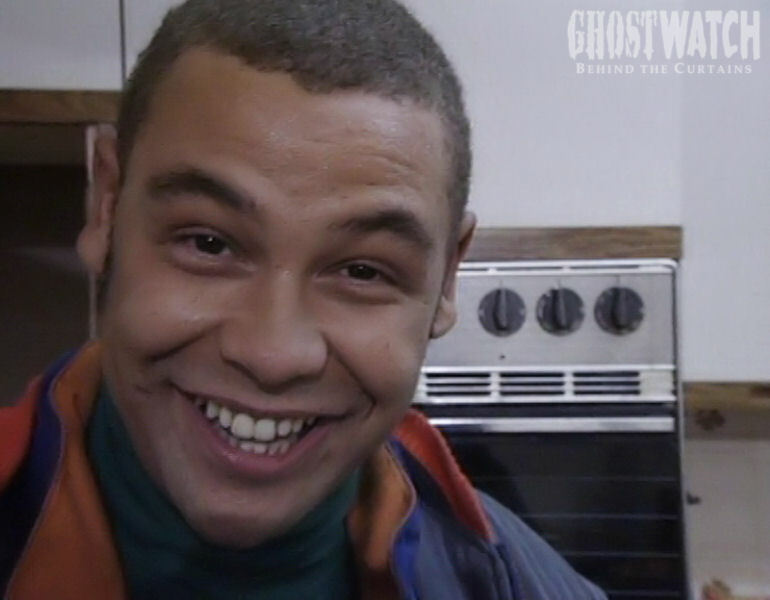 LITTLE KNOWN FACT: Craig Charles did not star in Ghostwatch. His role, was in fact, entirely portrayed by on-screen double, Lloyd Mullaney. And that's a hundred-percent true, that. 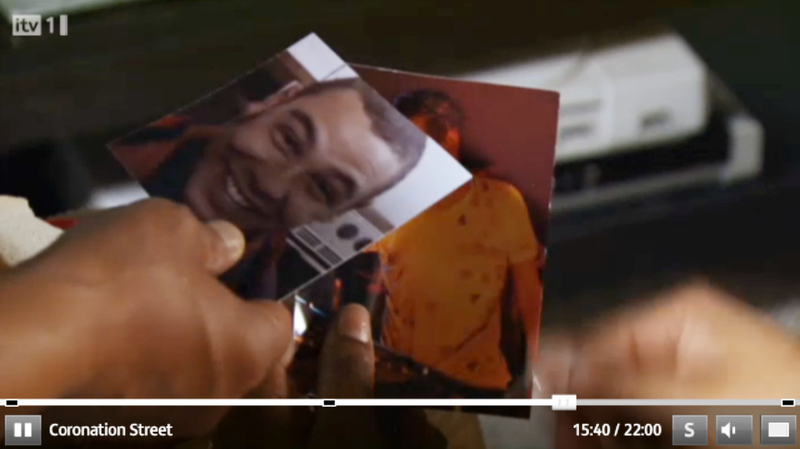 It seems that during last night's episode of Coronation Street (specifically, the 7.30pm episode on Monday 1st Oct), a handful of old photographs were presented as undeniable proof that lovable character, Lloyd is father to a long-lost daughter, or something. And wouldn't you know it, one snapshot clearly shows old Doormouse Cheeks at the house in Foxhill Drive (specifically, the Early Family's kitchen), grinning away into camera with his own inimitable brand of chirpy, gerbil-faced optimism. 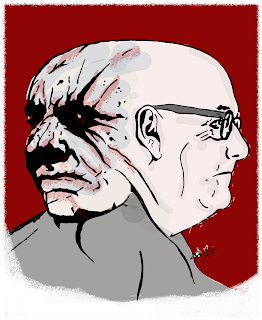 Not only that, but this strangely-reminiscent image appears to bear a striking resemblance to the very same informative screen-grab headlining Craig's bio in the blog's Cast Section (minus the watermark, naturally). "Get out the way a minute, you're in the middle of my close-up..."
Incredible coincidence, or just 'faces in the fire'? You decide... No, wait, I'll decide for you. It is the same picture. There you go. Seven-seconds of thinking-time saved. Now, feel free to savour in the blissful insanity of this staggeringly-quaint revelation - GHOSTWATCH WAS FEATURED IN CORRIE LAST NIGHT. And if you'd like to see the scene for yourself, head on over to the ITV Player and skip ahead to the 15:30 mark for the start of the scene. Hold up, wait a tick! What was that I just glanced? You can never quite tell, what might be lurking behind the curtains. 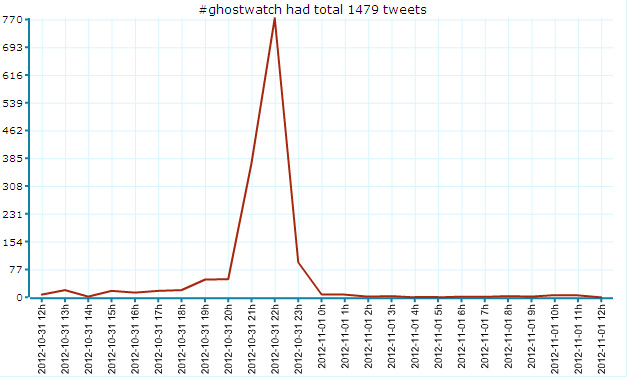 Greetings, Ghostwatchers! 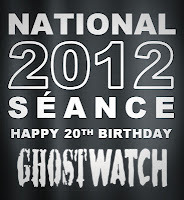 Fire up your Twitter engines and dust off those serial port keyboards, it's almost time for National Séance 2012! 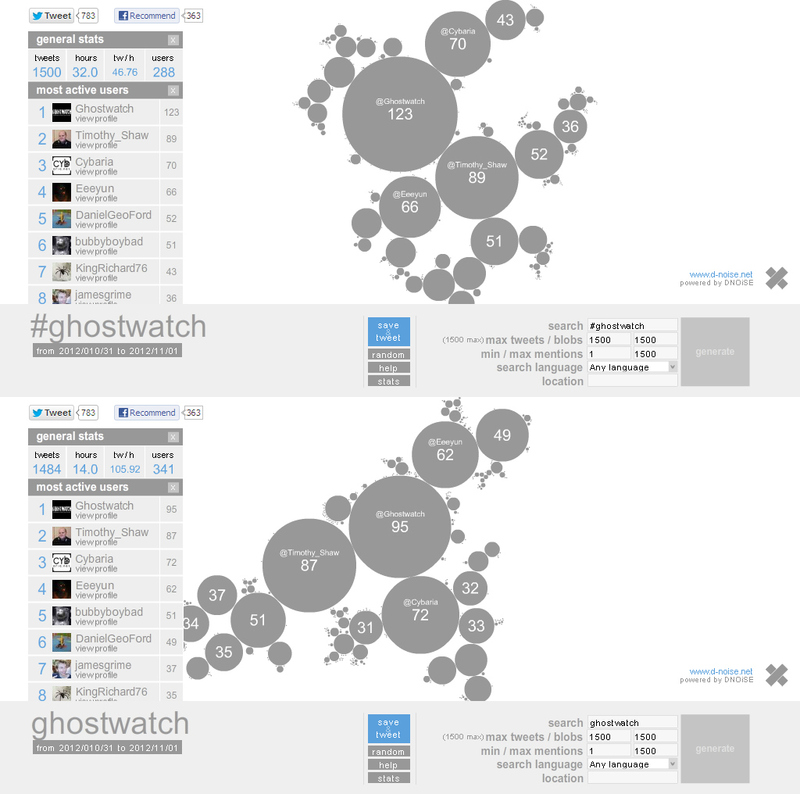 ...which should hopefully update and display all new Tweets as they come in. 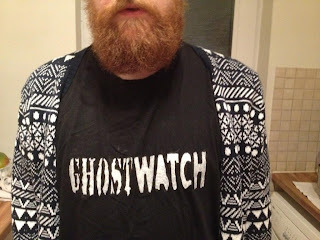 Keep your eyes peeled for the ever-bashful, Pipes the Poltergeist - if you see him, be sure to mention when and where, and add the #PipesWatch hash-tag alongside the #Ghostwatch tag. 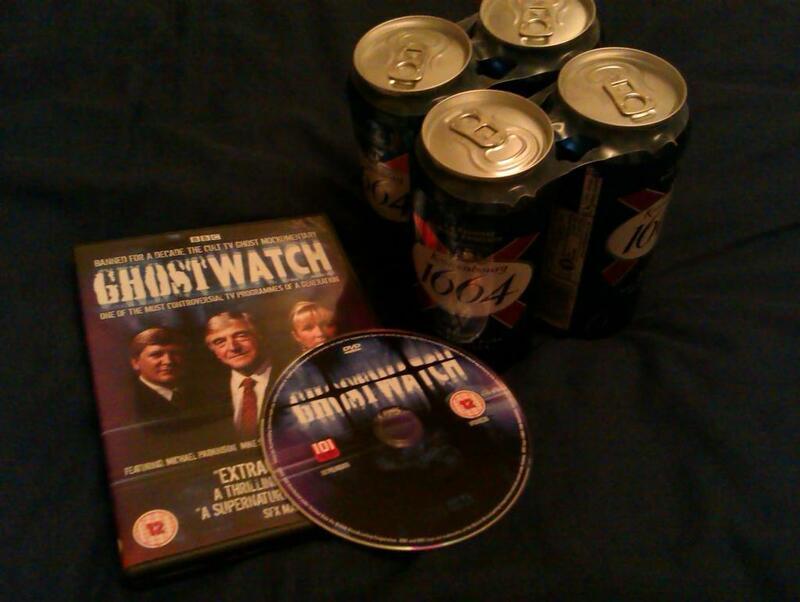 ...But depending on which version DVD of Ghostwatch you might be using, it may be necessary to start your copy slightly earlier. 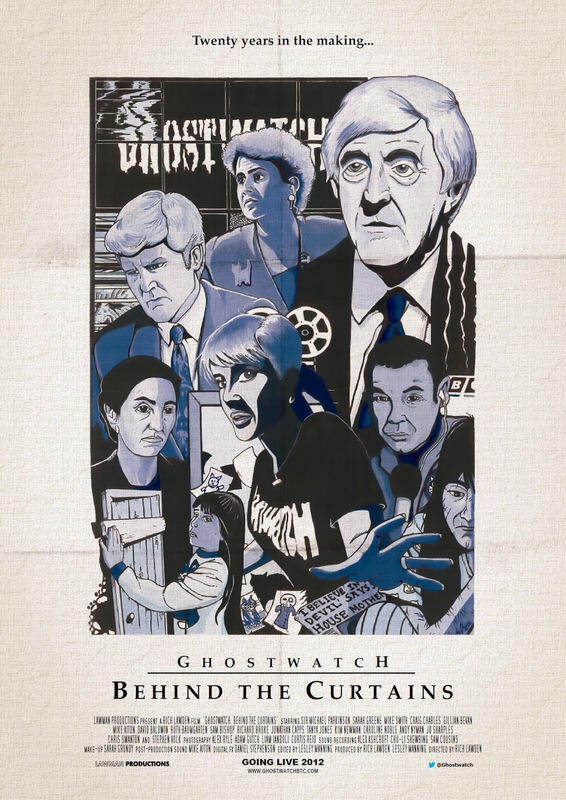 If you're watching from the BFI DVD, you can start playing the video above at about 21:24:14 and then start Ghostwatch immediately after. If you're watching from the newer 101 FILMS release, you can do the same as above, but only need to watch the Continuity Announcement. As soon as you see the blue-ish TV Screen that heralds the start of the classic Screen One ident, that's the moment to start playing your DVD. Ooo nice @Ghostwatch question on big fat 90s quiz there! ...And just like that, +1 channels suddenly make a whole lotta sense. 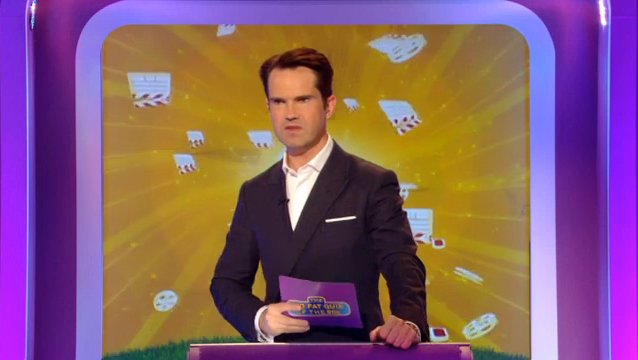 About an hour later (on C4+1, naturally), presenter Jimmy Carr asked his three teams of celebrity panelists on The Big Fat Quiz of the 90s the following question... again. "Sarah Greene was 'killed' in a basement, and Michael Parkinson was 'possessed' by an angry ghost called 'Pipes' in which "legendary" TV show?" Okay, let's get the nitpicking right out of the way. Technically, Sarah 'disappeared' into The Gloryhole (not counting the revelation of her eventual fate in '31/10'). Also, The Gloryhole itself isn't a basement, rather an under-stairs cupboard. 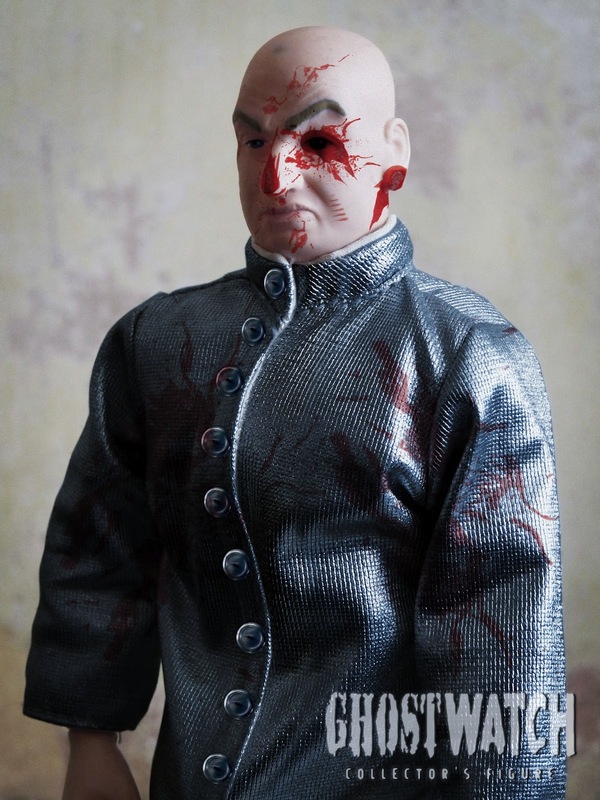 Plus, within the context of the story, was Sir Michael Parkinson truly 'possessed' at the film's climax or was the Ghost simply still in the machine..? "WHO CARES?! ", you ask? Right-oh, onto the next section, then. Straight in with the correct answer was Buzzcocks stalwart, Phill Jupitus (doffs cap, accordingly). 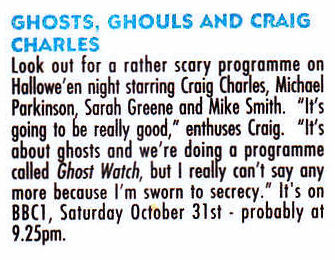 Though despite getting the answer right, Dara O'Briain and Claudia Winkleman just couldn't help but say 'Ghostwatch Live' which of course, was an unrelated BBC show hosted by Claudia Christian in 2001. I'm not a sceptic. I'm not a believer. I'm open-minded. Sometimes, things can be explained. Sometimes, they cannot. Any true-life oddity that, despite all efforts, remains intangibly inexplicable suggests to me that the average human mind is either somehow incomplete or deeply flawed in its problem-solving capacity. 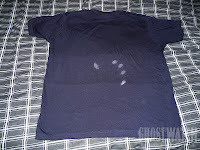 ...HOW DO YOU EXPLAIN THIS SUDDENLY APPEARING ON THE BACK OF MY SHIRT WHEN NO-ONE HAS TOUCHED MY BACK ALL DAY? Genuinely spooked by this one, dear readers. Even stranger is that the mystery mark staunchly refuses to come off. 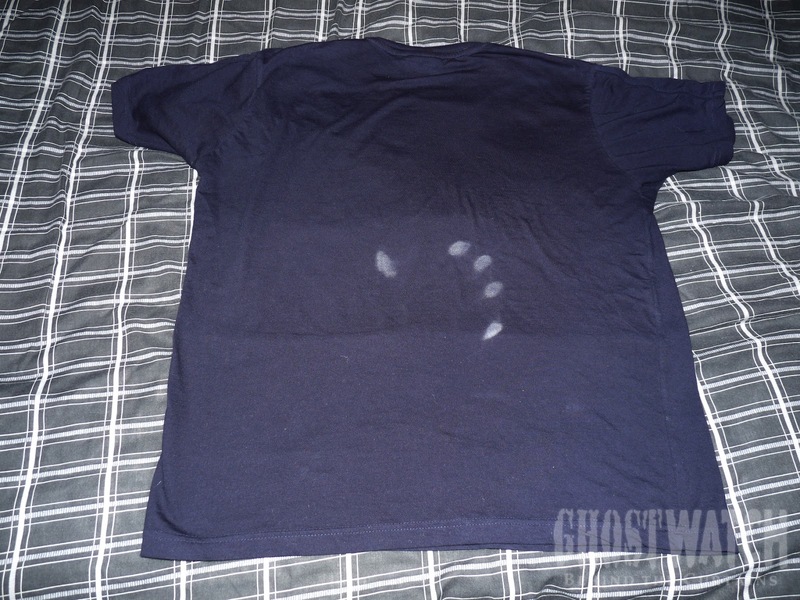 Unless someone recently dipped their fingertips in bleach and snuck up behind me with the silent grace of a ninja-trained xenomorph, I truly cannot see how this came to pass - not to mention, remain undetected for so many hours. *Special Mention - The name of this article is one of many gems contributed by BtC supporter, Arfon Jones. 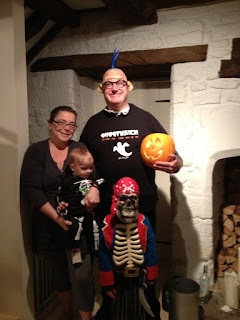 We've been looking for an excuse to use it as a blog title for about five years..! As if fact hasn't crossed over into fiction enough around these here parts, check out this spooky scene recently caught on camera by writer/creator, Stephen Volk - who admits to being "genuinely terrified" at the time of taking it. 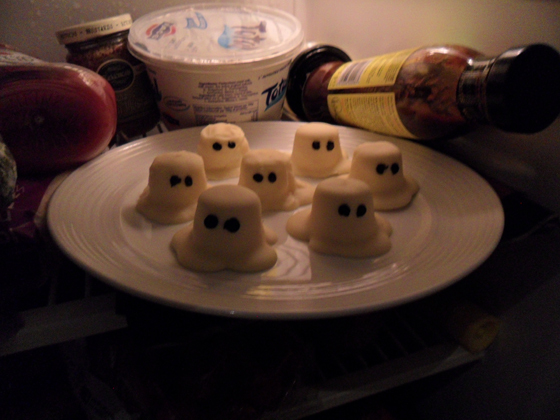 Irrefutable proof of life after death? Some kind of intense psychomagnatheric disturbance? 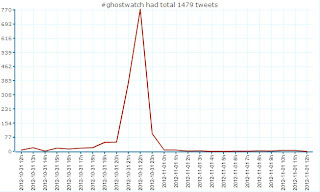 Or perhaps just indicative of a distinct lapse in essential window maintenance? 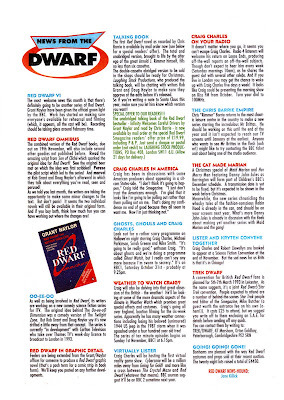 If our recent Series X article wasn't enough (before you ask, no we're not slowly turning into a Red Dwarf fan site...), the notoriously modest Rear Admiral Lieutenant General Symes from Ganymede & Titan recently stumbled upon this gem from Issue 9 of the classic Smegazine collection from 1992. 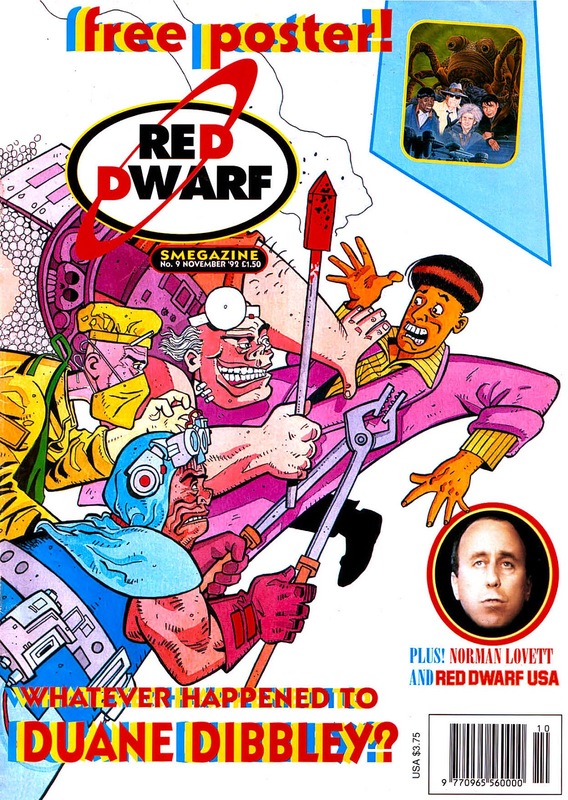 For those not in the know, two volumes worth of Smegazines, originally entitled The Red Dwarf Magazine, were published between 1992 and 1994, and are now considered to be serious collector's items among merchandise-hungry fans. Often showcasing rich and varied content, articles ranged from original & adapted comic stories, sneak peaks of upcoming episodes, and reports covering related cast projects, etc. Funnily enough, this particular issue is dated, 'November 1992', but I've been reliably informed that Issue 9 was actually published in late October - just in time for broadcast. Enjoy! Last December, I was fortunate enough to be part of the live studio audience for the very first episode of Red Dwarf X to be filmed at Shepperton Studios. Neatly bookending my experience (to say the least! ), on Friday, I attended the final show, too. Since 1988, thanks largely to strong viewing figures and an impossibly loyal and dedicated fan-base, this acclaimed sci-fi/comedy series has proven itself to be more resilient than a lump-hammered Talkie Toaster™. 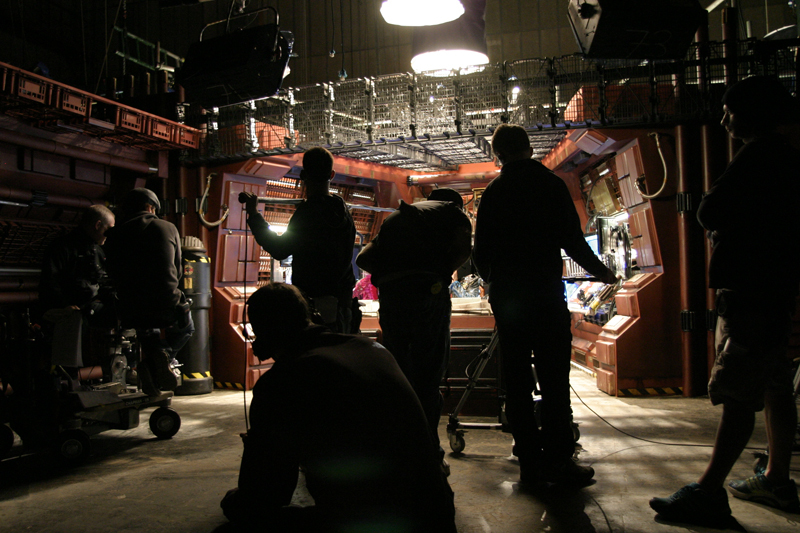 Famously, during rehearsals on the first series, an electricians' strike very nearly pulled the plug on the entire project before it even had chance to air. 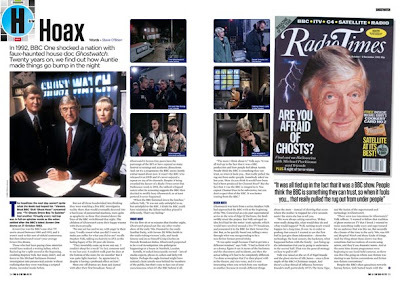 A three-year hiatus between later series would also keep fans guessing as to the programme's future and possible change in direction - culminating with the BBC rather tactlessly admitting they were "no longer interested in the audience [the show] used to attract". But ultimately, and thankfully, these setbacks did little to dissuade digital channel, Dave from taking the plunge and commission six, brand-new episodes for us to check out later this year. 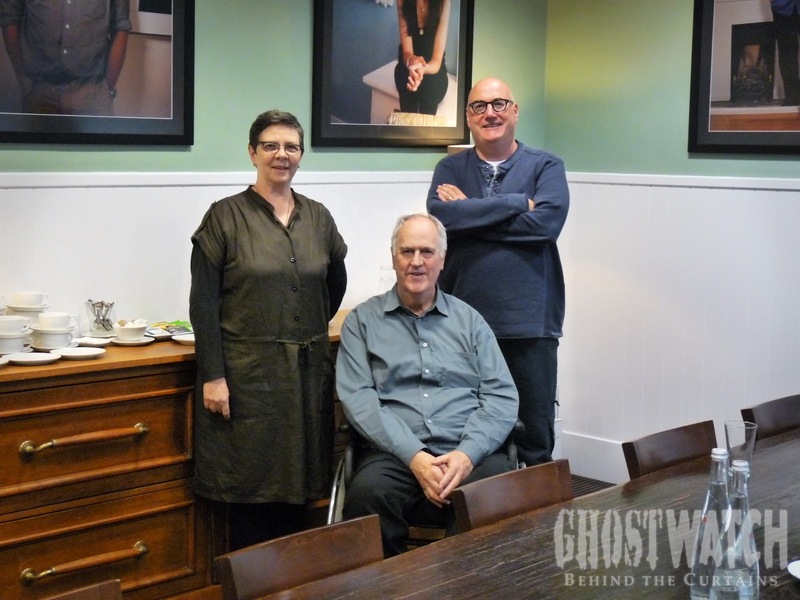 Without giving too much away, the core cast-members are all back and kicking bottom. Plus, the up... sorry, downgraded sets are truly gorgeous in that grubby, lived-in kind of way that certainly feels more in line with the show's earlier, more textural, Cyberpunk-centric leanings. Another big plus was the inclusion of a varied and largely spot-on guest cast who help keep things moving at an altogether, brisk pace. Many of these new faces were, for my taste, nothing short of terrific and are surely destined to become future, fan favourites, on broadcast. Not content with 'mere' HD images, writer/director, Doug Naylor has successfully furthered his quest to push for a more filmic look (a hallmark of the show since Series III), by utilising the maddeningly-sophisticated RED cameras to help bring a new kind of clarity, not seen since the recent three-part special, Back To Earth (which itself played to record viewing figures back in 2009). During filming, monitors were strategically placed in front of the audience to display pre-recorded footage or live sets that were just out of our peripheral vision. 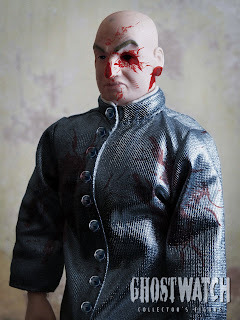 Strangely enough, the images looked so good that at times, I often found myself staring at the screens even when the cast were performing in plain sight. 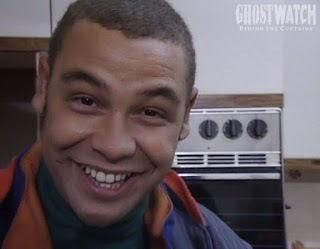 But despite the undeniable leaps and bounds in technical dexterity this new series has to offer, much of its success can, and simply must be attributed to the indispensable ensemble cast, headed by Ghostwatch's very own 'Interviewer', Craig Charles - who effortlessly returns as self-confessed, 'Space Bum/Curry-Lover', Dave Lister. Annoyingly, he hasn't aged a day since we last saw him and is clearly enjoying performing in front of a live studio audience again. It's great to see Craig back doing what he does best and we had a blast recording his interview for the doc earlier this week. Simply put, I genuinely enjoyed the shows I attended - particularly as they were fascinating to watch from a behind the scenes perspective. 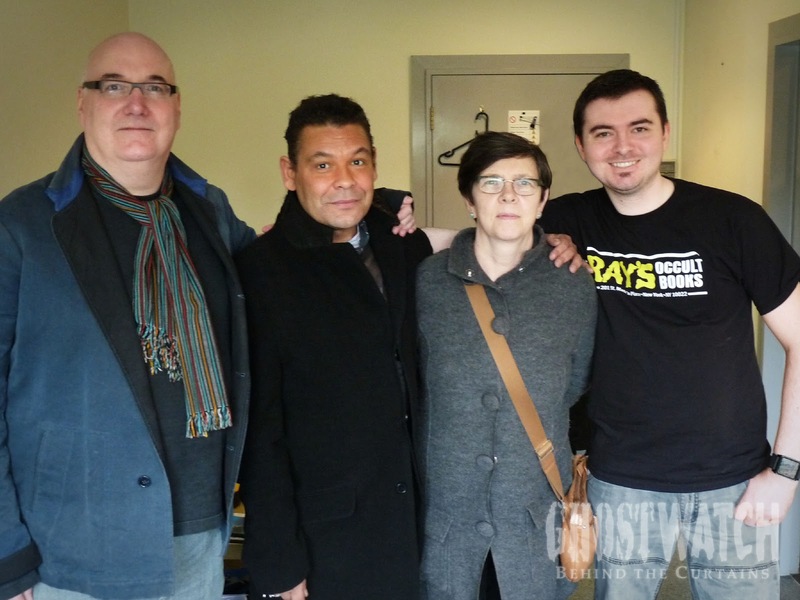 On the whole, they felt like a much-welcome return to the glory days of Red Dwarf, back when the show was an all-too-often unsung world leader in comedy, design and production. 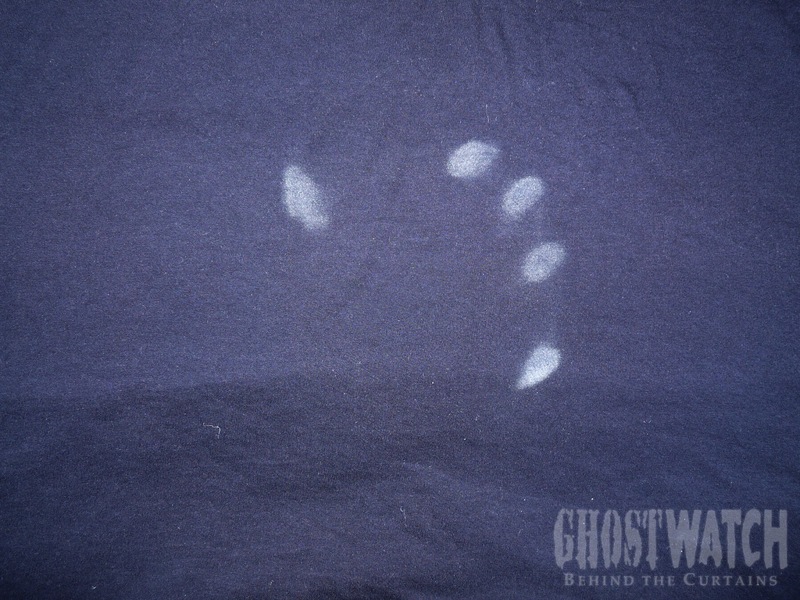 Bearing in mind its notoriously unpredictable filming pattern, where the series goes from here is anyone's guess. Above all, I just hope The Powers That Be continue to realise and respect Red Dwarf's potential. It's not every day you get a cast and crew this good (or for that matter, hardworking) in the same place at the same time. And I for one, hope to be attending a 'Series XI' recording very soon, indeed. Until then... hit the retros! At around the 24 second mark on the following YouTube clip (courtesy of Dave), yours truly can be seen as one of at least two people not performing the requisite Mexican Wave when instructed to by that night's warm-up. Why? 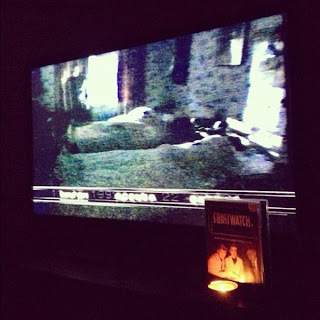 Because I was so engrossed by the stunning new set design, obviously. Either that, or I was just *slightly* tispy - I can't quite recall.